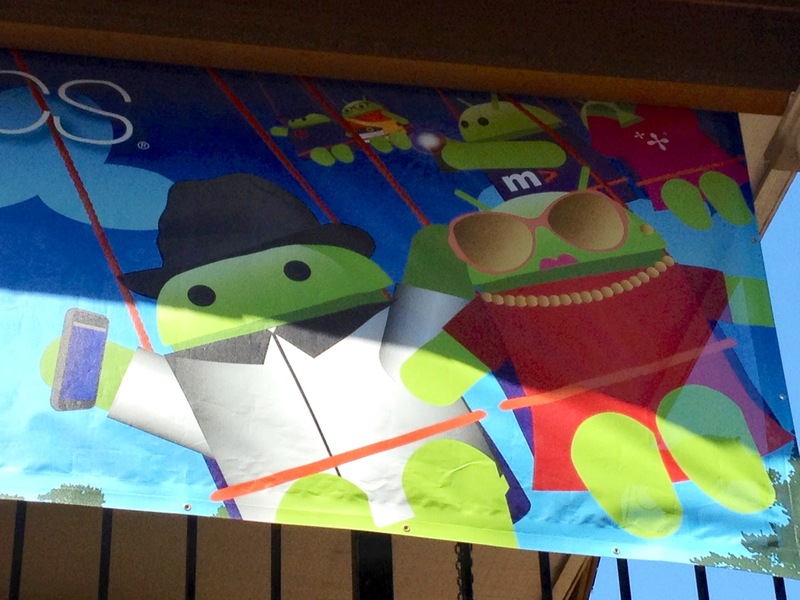 Advertising in an Amusement Park – Practice what you Preach! It’s okay to film and photograph on rides with your phone, according to this ad – but not according to park rules and announcements. Don’t believe me? Check out the figure with the “M” on their shirt. Yup. They’re snapping a photo while the ride is going. What’s even more troubling – they’re snapping a photo on what appears to be a swing ride – an attraction that had just debuted when I visited this year (2013); in fact, it’s the tallest in the world at 400 feet. It also happens to be located next to the main roadway entrance to the park. Boy, that be a heck of a way to start your day when you’re driving into the park and your windshield shatters from a loose cell phone, don’t you think? If you’ve read my previous post on this topic, this epidemic of cell phone filming is only going to become worse as the Millennial generation becomes of the age to own a cell phone. Showing ads like this, then telling them to not have loose articles aboard the ride? It just wreaks of, “What were they thinking?! ?” and it’s just plain DUMB in my opinion. Seriously – how did this ad proof get by both the corporate offices AND the local marketing officials?!? Cell phone carnage under Mr. Freeze: Reverse Blast at Six Flags St. Louis. That was before this past weekend, however. That’s when I DID witness several people get injured by a loose cell phone at the Santa Cruz Beach Boardwalk. 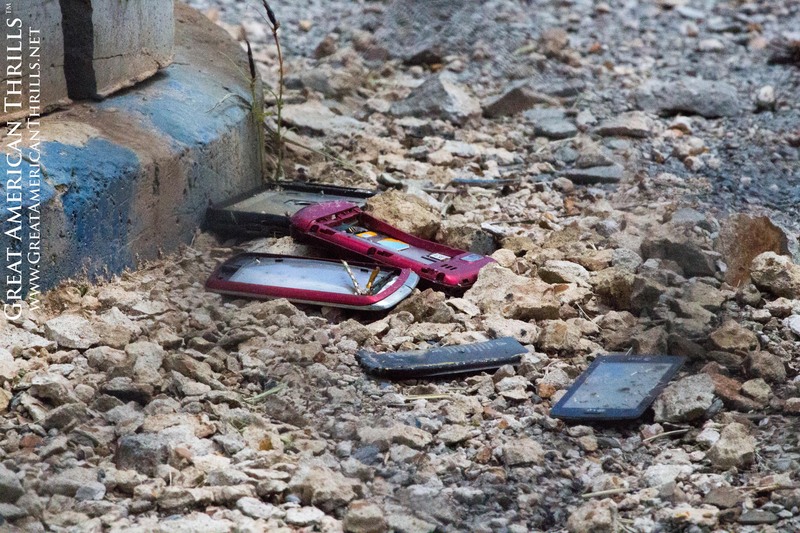 The guest whipped out their cell phone after concealing it on the “Double Shot” freefall tower attraction just as it launched – and wouldn’t you know it – the phone got loose, fell 125 feet and promptly smashed into guests waiting in line. This madness simply has to stop – before someone else is either injured or outright KILLED by a flying, loose article. Ads like this aren’t doing the parks any favors. They’re literally shooting themselves in the proverbial foot. You sure about that? Because I’m lovin’ it. You thought of McDonald’s just now, didn’t you? Feeling a bit hungry all of a sudden? As much as we don’ t like to think it, advertising is a very powerful tool to control behavior – so to encourage the very behavior you’re trying to eliminate in your safety spiels and park map rules is well – not the smartest move in my book. My point is this – advertise all you want to your guests, but at the very least, practice what you preach! June 26, 2013 | Categories: Amusement Parks, Social Media, Social Media and your Amusement Park (SERIES) | Tags: amusement park, amusement park review, amusement parks, android, android users, cell phone, cell phone camera, cell phone cameras, cell phones, great american thrills, illegal filming, kris rowberry, kristopher rowberry, la vibora, loose articles, metroPCS, mobile phone, mr freeze, on-ride filming, PCS, POV, pov video, robb alvey, six flags, six flags over texas, six flags st. louis, SM2, SM2 designs, social media, social media strategy, st. louis, theme park, theme park review, theme parks | Comments Off on Advertising in an Amusement Park – Practice what you Preach!